Once again, with Tom absent and lazing in the Australian sun, and a dearth of blog volunteers, you have me (Roger 1) inflicted on you. So, be kind if I have missed birds, misspelled member names, etc. Following the most days of rain ever in October, the first of November was more promising and 13 members meeting at Petra’s and 12 more at the Lighthouse Park at Point Roberts. We were all happy to have Anne Murray making an appearance after a long absence and we were to make good use of her identification skills. Great to see you, Anne! Although there was no rain it was quite chilly with a slight breeze off the water. Unfortunately our arrival coincided with the high tide of the day which limited the birds we would usually see on the shoreline. We were a bit disappointed that the movement of Bonaparte Gulls seemed to have passed and therefore we were to see no Parasitic Jaegers. However we were able to sight the following… Horned, Red-necked, and Western Grebes (most far offshore), Common Loons, both Surf and many White-winged Scoters, Red-breasted Mergansers, a few Long-tailed Ducks, and large numbers of Pelagic and Double-crested Cormorants. While watching the cormorants fly by, Anne described points used to separate Brandt’s from the Double-crested, something which most of us have been confused about, especially with them in flight! A possible Pacific Loon flew past and one Common Murre “looking like a pelican” was seen in at a distance. Disappointingly, there were no Murrelets, or Auklets to be seen! We did see, however, the first flocks of Brant for the season. Our car sighted one Red-tailed Hawk as we drove towards the meeting point, and there were a few Bald Eagles on pilings, and a few Great Blue Herons as well. Having exhausted the species to be seen at the Lighthouse, we posed for the obligatory group photo and left for the marina. On the road to the marina we paused to scan the pond on the north side of the road and found many Hooded Mergansers, Buffleheads, and some Greater Scaup. Flying by, and in the trees, were lots of American Robins, some Northern Flickers and a single Belted Kingfisher. We bypassed the path, between the two properties, leading to the shore as we had too many cars and there was so little parking space. With the high tide there was little exposed shoreline for the birds we would normally see there anyway! At the marina we walked across the field, sighting two House Finches on the way, to the boat canal where we found a large number of Harlequin Ducks and Black Turnstones basking in the sun on the rocky shore. 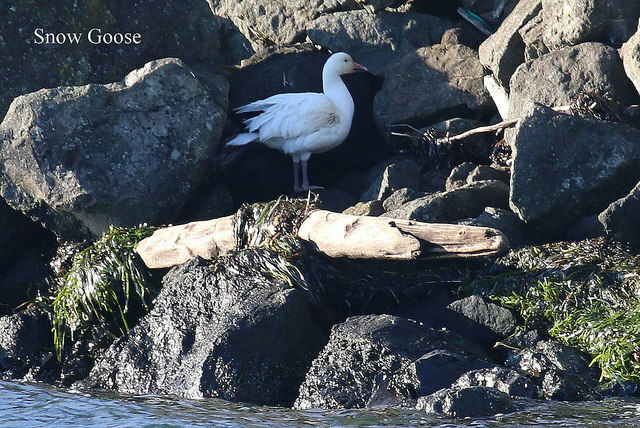 On a log on the opposite shore, picked out by eagle-eye Marion, was a single Snow Goose (we wondered as to its health as it seemed strange for it to be on its own). Retracing our steps across the field, we went down to the exposed shore and crossed a width of beached seaweed to see a Western Grebe close up, and a mixed flock of Sanderlings and Black Turnstones feeding at the tideline… a beautiful photo opportunity! The marina location is a site where we often see Western Meadowlarks, but not today! From the Marina we would usually go to Lily Point but today we decided to go to Maple Beach to be closer to the Boundary Bay shore and, maybe, see Black Scoters… we didn’t! However, we did see lots of Surf and White-winged Scoters, Buffleheads, a few American Wigeon, more Western, Red-necked and Horned Grebes, Mallards, and Red-breasted Mergansers. Having exhausted the birding sites of Point Roberts we decided (it was only 11:00 am) to call-it-a-day! It was suggested that the Terminal jetty had Snow Buntings and a Whimbrel seen there the previous few days if any of us wanted to extend the day. So, Tom, it was too early for lunch and the day ended on that note. Next Tuesday, November 8 we leave Petra’s at 7:30 hoping to arrive at the Second Beach parking area in Stanley Park (just west of the pool) by 8:30 although 9:00 would be more likely. This entry was posted in *DNCB, Bald Eagle, Black Turnstone, Common Murre, Harlequin Duck, Lighthouse Marine Park, Long-tailed Duck, Pacific Loon, Pelagic Cormorant, Point Roberts, Red-breasted Merganser, Red-necked Grebe, Red-tailed Hawk. Bookmark the permalink.